See, the first time I had seen a commercial for it, I was 11 years old, and it aired during Saturday Night Live. 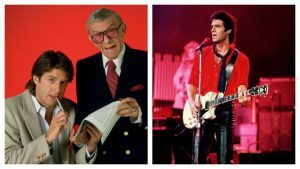 I had known, in my limited experience with the show at the time, that SNL aired "fake" commercials, and the idea of a movie where George Burns played BOTH God and The Devil was just SO ABSURD that I presumed it was a joke that the SNL people cooked up. So, a bit about the Oh, God! 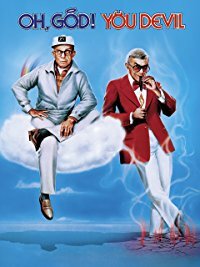 movies, which were a deeply strange vehicle for George Burns, where he plays God. In the first two movies (Oh, God! and Oh, God! Book II), the pattern is more or less the same-- God shows up in someone's life, and that person is the only one who can see and hear him. God expects them to act as a modern day prophet, and while they do, it creates enough of a stir that some form of legal hearing is held to determine that person's sanity and welfare, and God shows up at said hearing to show up the doubters, and then leaves the person's life again. The only real difference is, in the first one, it's John Denver's life he upturns, and in the second, it's a little girl. Burn's God is kind of a blandly non-denominational, vaguely-Christian God that the kind of person who says "I'm not religious, but I'm spiritual" could be comfortable enough with. You could even argue that God's choosing a form that would appeal to the middle-American vaguely Christian crowd, but that doesn't necessarily represent who God truly is. It's a movie that strives not to offend by showing God but being non-committal about it. The third movie breaks the formula, so you kind of have to give them credit for that. Instead, it focuses on Ted Wass's Bobby Shelton. You remember Ted Wass fro previous Bad Movie entry Sheena, right? This was his career heyday, I presume, which wasn't much. I do have a strong recollection at the time my aunt once declaring, "Why would you make a movie starring Ted Wass?" This is the extent of his infamy. Jump ahead twenty-some-odd years, and Bobby is a happily-married-but-deeply-struggling musician. After missing out on yet another contract opportunity, he mutters the fateful words, "I'd sell my soul for a record deal." Everything. Bobby suddenly finds his identity shifts to "Billy Wayne", rock-and-roll superstar. He's suddenly huge, playing massive concerts, everything going amazing. Confusing, but amazing. Everything he wanted. Except he wanted it as Bobby Shelton. What's worse, since he's lost his identity, he's lost his wife, which is what he realizes he really wants in life. He even stalks his wife, finding out she's pregnant, and there's just some guy there who's "Bobby". There's definitely some strangeness in this movie that there's a person-- presumably a real person with a soul (within the context of this movie's rules) who WAS Billy Wayne. Some other person "becomes" Bobby, and...it's just confusing. But, the point is, his wife isn't actually missing him. When Bobby wants out, the Devil just laughs at him. There's no out, because: Devil. So Bobby prays to God to help him. And then drinks heavily and takes a ton of pills. And then we get the Big Scene that we've been building up to: the Split Screen of George Burns playing God and The Devil together. Anyhow, God and the Devil play one hand of poker for Bobby's soul. One hand, five-card draw, just that. So how does God win this over the Devil? He raises. He puts all of his "watched over" souls on the table. The Devil decides that's too much, and folds. Then God shows he had a busted flush. Bobby suddenly finds himself watching on the sidelines as "Billy" is found dead of an overdose. They even flip "Billy" over to show he has another face, and... who is it? What happened to that guy? I'm not sure. He doesn't matter, because God didn't come save him. I mean, God comes off as playing some serious favorites here, I'm just saying. Finally we cut to a few years in the future, where Bobby's daughter is sick, and like his father, he prays for her, and sings "Fugue for Tinhorns" to her, which God joins in on, because that's what God does. 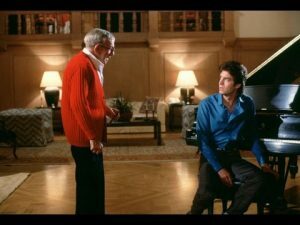 I mean, so much of this movie is all about that poker table scene, and when you come down to it, it's just George Burns doing his George Burns bit opposite himself with a slightly more sarcastic version of the same bit. 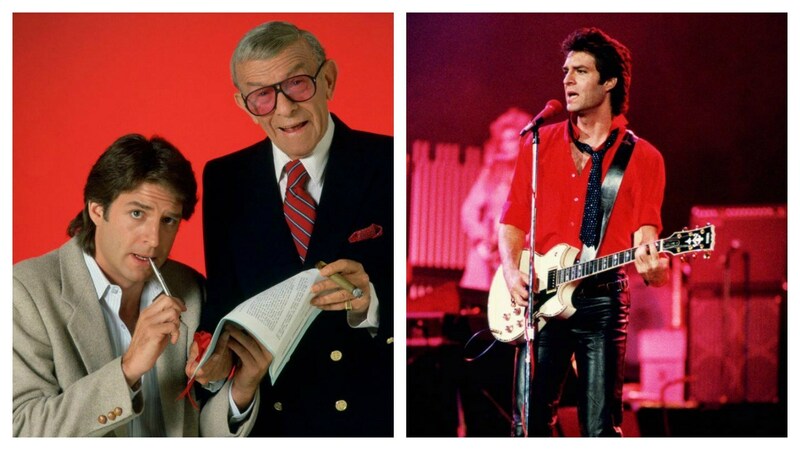 I mean, George Burns was a great presence, but he didn't exactly have range, you know? So Two George Burns isn't really that exciting. Fun story, this script apparently came about because the studio wanted another Oh God movie, and the writer had an abandoned script about a musician selling his soul to the devil on hand, so he polished it up to make it a movie. Actual quote: "Not a good play, but it was there sitting on my shelf"
I am a movie fan and watch 1000 plus movies. But haven't watched this movie. I think that is because it is too old for me. But thanks for aware me about this story I will watch online this movie If I found that on the internet.